New Delhi, April 15: Congress President Rahul Gandhi once again ignited the possibility of an alliance with the Aam Aadmi Party (AAM) on Monday after he tweeted that an alliance between the Congress and AAP "would mean the rout of the BJP." Gandhi also mentioned in his tweet that "the Congress is willing to give up four Delhi seats to the AAP." However, the blame game between Congress and AAP continues, with Rahul Gandhi saying "Kejriwal has done yet another U turn!" Lok Sabha Elections 2019: Arvind Kejriwal Says Still Open to Alliance With Congress to Save 'India From Narendra Modi-Amit Shah Jodi'. 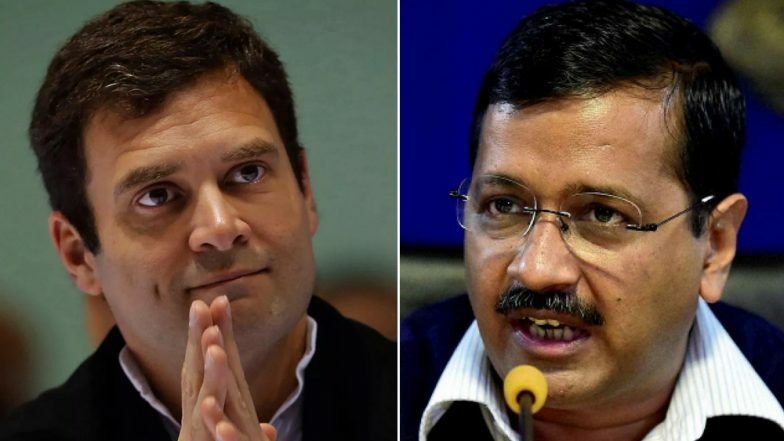 Rahul Gandhi's tweet comes a day after AAP chief and Delhi chief minister Arvind Kejriwal said that AAP was still open to an alliance with the Congress to "stop the jodi of Narendra Modi and Amit Shah." AAP-Congress Alliance Talks Fail, Both Parties to Go Solo in Delhi. Arvind Kejriwal, talking about the possibility of an alliance on Sunday, said that "the country is in danger. To save the country from Modi Ji & Amit Shah Ji's 'jodi', we are ready to do whatever is needed. Our efforts will continue till the end." Lok Sabha Elections 2019: AAP Joins Hands With JJP in Haryana After Talks Fail With Congress. However, the bone of contention between the two parties is Congress' refusal to join hands with the Aam Aadmi Party (AAP) outside Delhi, in states like Haryana Punjab and others. AAP leader Sanjay Singh also asked the Congress "what's stopping them from joining hands in other states like Haryana and Punjab."